I was reminded of TV dinners recently. I’m talking about the Swanson-brand type – a tin tray with several compartments and a thin piece of foil on top. You popped the things into a preheated oven and thereafter the extent of your involvement in the “cooking” was to remove the foil from the dessert corner of the thing if the dessert was a pie. My father did actually cook for us in addition to the TV dinners, and I know that my grandparents and family friends also contributed. I had only a vague memory of it until my mother went into the hospital the other day with symptoms that were similar to those she had in 1976, though not as severe. She’s doing well, and is under excellent care. My father is there with her, as he was in ’76. My wife and I went to visit my mother yesterday and while we were in the parking garage a friend of mine recognized me and told me his mother was there as well, waiting for him to pick her up. She’s one of the best people I’ve ever known, and she’d just had a loss. He asked if I’d go say hello and of course I did. I don’t do very well in these situations because I tend to get very emotional when someone I know and love has suffered a loss. I don’t even know what I said, but I hope I conveyed how much I love and respect her. And then we saw my parents, and picked up my son and daughter from school – because their school did not cancel classes because of the tropical storm that wasn’t. As I write this I’m at home having tried to work and run errands and cook dinner. And that’s where I’ll wind things up; with a pretty dramatic change of subject, because on Monday of this week we had my mother-in-law for dinner to celebrate her birthday. Every year on this occasion, my wife bakes an Angel Food cake, and if you know anything about Angel Food cakes you know it requires a lot of egg whites. Which also means that we had a lot of egg yolks left over. My wife, God bless her, is not a fan of raw eggs generally and certainly not after they’ve been sitting in the fridge for 2 days. Mayonnaise was not really an option. So instead I made pasta. I used to make fresh pasta about once a month, but I’ve fallen out of the habit. Fortunately, it’s not all that complicated and a quick search to confirm the ratio of egg to flour turned up a very good recipe from Thomas Keller’s "French Laundry Cookbook." I’ve actually got the book, but it’s a freaking beast and doesn’t fit into any of the shelves where I keep the rest of my collection. Put the flour onto a large, clean work surface and hollow out the center so that you have a ring of flour with a “well” in the middle. Put the rest of the ingredients into the well and mix them together with a fork or your hands to combine, then gradually stir in the flour from the sides of the well. Do this until the dough starts to come together and you’re no longer risking a liquid escape if you breach the walls of the well. Continue to stir and cut in the flour until most of it is incorporated, then start kneading. Knead for a few minutes then wrap it loosely in plastic wrap and let it rest. While it’s resting, either clean the work surface so you can start kneading again or have a glass of wine and find a new, clean work surface. Either way, after 5 minutes or so start kneading again by using the ball of your hand to push the dough away from you and then roll it back, twisting a quarter turn and doing it again. Do this for about 15 minutes. I have read that you cannot over-knead this dough, so what I generally do is knead for 10 minutes, take a quick break and then knead for another 10. What you want is a dough that is elastic, still slightly damp and almost shiny. When you push a finger into it, the dough should bounce back a little bit. Wrap it again in plastic and let it rest for at least 30 minutes. You can put it into the fridge at this point for a day or two, but bring it back to room temperature before you roll it out. I have a pasta machine made by an Italian company that attaches to a table with a vice, and that’s what I use to roll pasta into thin sheets. (Incidentally, I’m including links to Amazon because it’s easy. I don’t get anything if you buy things from them, and in fact I bought the attachment that cuts the pasta into fettucine or spaghetti from Caire). 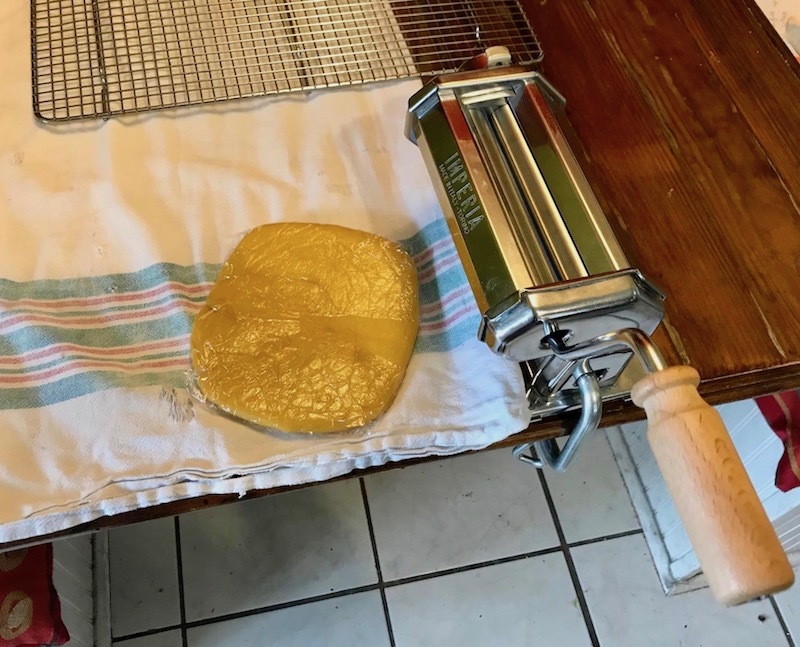 If all goes to plan, the image that accompanies this blog should be a portion of the pasta dough I made (about 1/8th of the total, I think) and the pasta roller. Beyond that, roll the pasta to your desired shape/thickness and cook it very briefly in a large amount of boiling, salted water. Fresh pasta takes only a minute or two to cook, so be wary if you don’t want to end up with limp noodles. I went to an old standard when making a sauce: I cooked a half-dozen chicken thighs with some chopped tomatoes and minced onion, bell pepper, carrot and garlic, then added some white wine, salt and a bay leaf. When the chicken is cooked, I remove it from the sauce and put it under a broiler to crisp up the skin, then use an immersion blender on the sauce to homogenize it before adding fresh herbs. Hopefully you can use the recipe above if you find yourself with a lot of egg yolks and nothing to do with them.